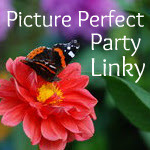 Thanks Heidilyn for joining my linky party! I love your photo! It's so cute! Thanks for letting me know about the problem with my button. I've fixed it even though I don't know much about html, but I noticed that there were a couple of mystery spaces in my code and I removed them and tested my blog button on two of my other blogs until I got it to work on both. Sorry that it took up some of your time. I hope you don't mind grabbing it again. :) Thanks! I'm still having trouble with the link even with the new html which makes me think it is on my end somehow, but I'm not sure how. I've used other linky buttons before and this is the first one that seems to not want to work.